If there is anything innovative educators need more of, it’s time. By being as complete and accurate as possible when creating a calendar invite, no one wastes time searching for location or materials. 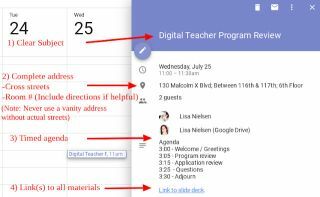 Creating calendar invites is an activity that today's modern learners should be engaging in daily. Doing this correctly is a skill that saves everyone time and should replace outdated practices like moving staff and students by bells and paper planners. Ensure guests know the real name and cross streets of the location. Using vanity addresses only (i.e. 1 Rockefeller Center, 2 Times Square) is particularly unhelpful. If the building entrance or room is tricky to find, remember to include helpful information for finding the meeting location in the calendar invite as well. What do you think? Would killer calendar invites help you save time? Do you include these elements in the calendar invites you create? Have you taught your students this important skill? Any other useful tips?